If you are on the market for an affordable wall oven you will have no doubt come across Empava. They offer a selection of different ovens for a selection of different prices. I have used a couple of there ovens but here in this article I want to focus on a particular oven that they offer. This oven is the Empava 24” Tempered Glass option which is the best one that they offer from my own experience. I want to bring it to your attention and give you my thoughts and opinions after using it for over a month. First of I want to talk about setting up the oven for the first time which was very easy, it only took me just over an hour to get everything unboxed and set up for cooking. Once you have everything set up and ready to cook you will immediately appreciate the design and style of this oven. It’s looks really elegant and classy not to mention it would fit in will well with any modern or contemporary kitchen thanks to its great design. In terms of how the oven functions it works really well. It isn’t the fastest oven to heat up that I have ever used but it isn’t the slowest, I would say it is around slightly below average and considering its price that is quite good. It took about 9 minutes to heat to 450F which I think is reasonable. As far as the cooking goes with this oven it works great and everything works just as you would expect. The heat in the oven is well distributed so there are no hot or cold spots or anything of the like. Another thing I want to mention as far as this oven goes for functionality is that is has 9 different functions all of which you would expect from an oven but its nice to see none of the obvious features have been cut to save costs regardless. A final thing I want to mention with this oven is that it is very energy efficient and has an A-class of energy saving which will undoubtedly save you money on your electric bill in the long run. As far as the oven is made and the overall quality – I would say it is durable and will definitely last for many years to come. Considering the price this oven is excellent value for the money. It’s also worth mentioning the oven comes with a one-year warranty with only covers certain (limited parts) which is a downside for sure. The display is LED and it uses touch buttons and it looks great in person and is easy to read. With the controls though they are a different story. The controls do take some time to get familiar with and they aren’t the most intuitive. Though at least once you have been using them for a little while operation becomes easy but having this “learning curve” isn’t what you want. Overall while this oven from Empava isn’t the best oven I have ever used it certainly offers a lot of value for a very affordable price point. You get all the important functions you would get with most other expensive ovens and you get a well-made oven that is elegant and well made. Of course, it does have a couple of minor issues but considering the price it is hard to argue that these downsides are even too substantial. 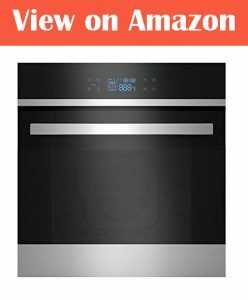 If you are looking for an affordable oven that is well made and has the core functions you want from an oven this Empava is definitely a good choice and I recommend it.